yeah, i have the original.. I wish i would have waited.. i'd of gotten the KO.. not the Oversized one, or the weird colored one, but the one that looks exactly like the Warby one, scale and all..
it's way cheaper on Sirtoys. Still..go with jinbao. I've had both, and sold warbo a while back. Finally able to transform and take the following pictures. I call these guys the first set of Decepticon triplets! Why? Aside from Devastator being introduced in the last episode of season 1, these guys basically dominated the combiner episodes of season 2. And all three have earth vehicle modes, unlike the latter three that are all creatures. I'm also amused that each of these guys is the first combiner attempt by the three different iterations of what is basically the same company: Warbotron/Generation Toy/TransForm Mission. I tried to capture Bruticus in a brutish-looking stance. He is the best combiner of the three, though the Combaticons are the weakest, especially Onslaught. Alt modes are okay. how do you make him stand as tall as the bruticus? and what have u done with those side bits on the legs? they annoy me as his legs are too fat. That's probably the oversized KO of Feral rex, and their arms fold and peg in around the back in leg mode. Some recent pics of them in the mix. So as these guys were originally being released I bought the first three. I sort of lost interest and was thinking about going back and picking up Onslaught and Vortex. How does this set hold up over time? Would I be better off using the $150 it would cost for picking up the rest of Warbotron on one of the new Bruticus sets coming out? I transformed the 3 figures i have into their limb modes today, just to make sure mine didn't have any issues. I originally was buying them as my masterpiece versions, but I booted them off the shelf when it got too full. I've got both the complete Warbotron set and the Jinbao set. I personally like the Warbotron set a bit better. They feel a little more sturdy, whereas the Jinbao has a cheaper, lighter feel to them despite being bigger. I also like the light piping in the Warbotron Combaticon's eyes, the Jinbao set doesn't seem to have much, if any, of that. If you like light piping like I do, that's a plus for the Warbotron set. However, they're both nice sets. Agreed. I've said much the same about MMC's releases. They're right in between MP and Classics. A very good place to be if you're trying to sell as many toys to as wide an audience as possible. Personally, I'd like my combiners to be as close to the same size as possible as that's how they were portrayed in the cartoon and in every scale chart I've ever seen. I'm very much an "Orthodox" Transformers fan. The closer to G1,warts and all, the better. 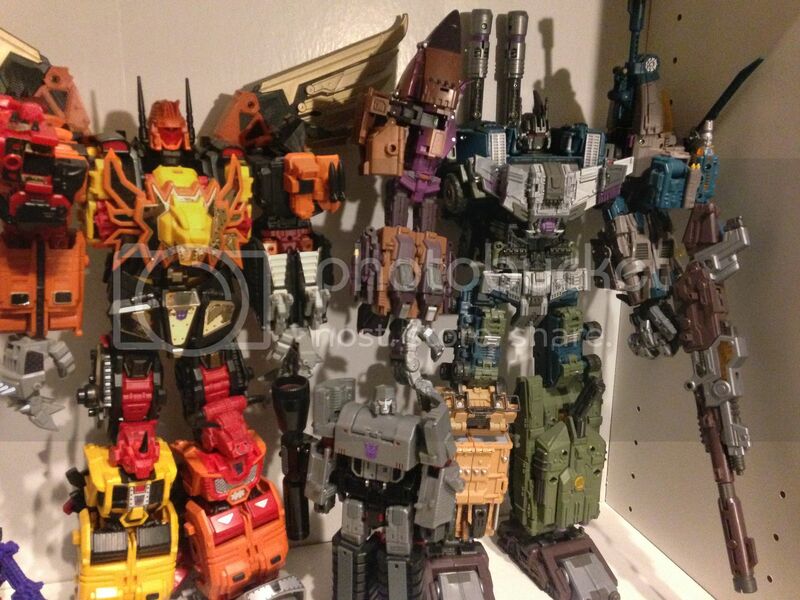 Is Bruticus meant to be the same size as Devy? I don’t know if “meant” is the right word for it. But usually, when Combiners fought in season 2, they appeared evenly matched, size-wise. That pattern has led many fans (including myself) to want all their Combiners to be the same size (which can make things messy when looking at alt modes or the Sunbow chart). It depends much on personal preferences too, I mean, in real life, military vehicles are bigger than normal cars (and specially an space shuttle that is huge) but construction vehicles are bigger too and with Devastator they was 6 components so, you could say they can be same scale been a little permissive with real life scale (space shuttle, hehe). In G1 animation, all they was same size, even the ones made by animals, like Predaking, only Omega Supreme was bigger. 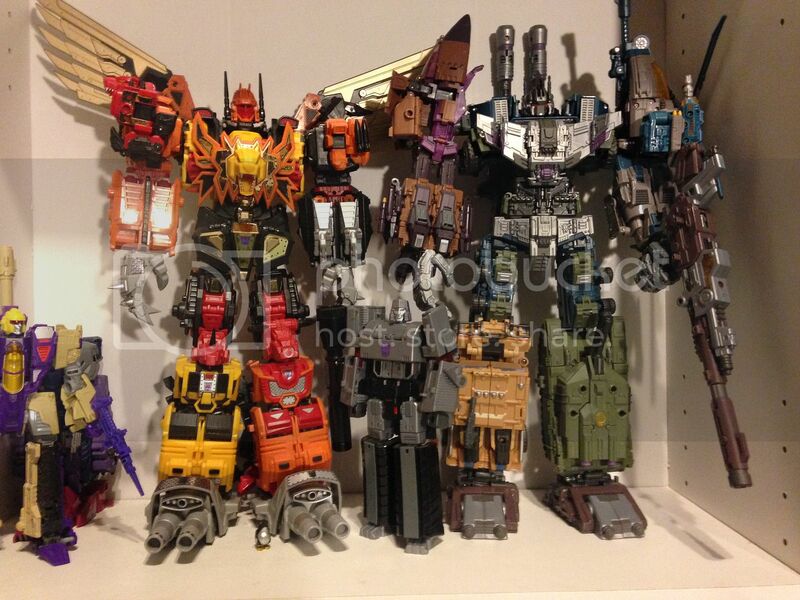 For me, I like Devastator and Bruticus same size, Menasor just a little small (just a hair) and the rest smaller than Menasor (not much) and for Autobots, Superion as the taller one and Computron and Defensor as Menasor size, just my personal preference. Because the shoulder width was narrow, petit remodeling. So this set is 200 including X-ray at bbts so I picked one up, not blast off was missing one of the handles on his missle pod but seems like a solid set. The Jinbao OS KO set is great too. "Ratched" up a notch.